The prior post in this series on the math of “free college for all” was about the application of the “fixed-cost dilemma” to higher education funding, which unavoidably skews the financial choices made by college and university administrators based on the accounting treatment of fixed versus incremental costs in their institutions. There is no better place to look at this issue than in the strong ties in the American university system between basic education, which can be relatively cheap to deliver. and intercollegiate athletic competition, which is often very expensive. The reality is, however, that one reason some European countries can deliver high-quality university education credentials at a socially-acceptable absorption of student costs is because intercollegiate athletic competition is typically only a very small part of the European university experience. And as to the frequent racial imbalance of athletic teams as compared to the rest of the institution, let me suggest that we may want to re-think that the only way we can get students from racial minorities through our education system is to demand that they “perform for free” for the rest of us in return for the collective absorption their tuition costs. Perhaps, like I was many years ago, they should be afforded the opportunity of a low-cost post-secondary education simply because they are citizens of the United States, athletic skills or not (and in my case, not). The Knight Commission maintains data on academic versus athletic spending for major athletic conferences. The data below is for the NCAA Big 12 Athletic Conference during the 2015 academic year. Note that the huge dollars for athletic spending per athlete are mostly generated outside of direct institutional funds (by television rights, etc. ), but nonetheless, institutional spending, derived from tuition and state funding, is still almost 30% of the level of academic spending per student. Also note that there are often additional unidentified institutional costs for athletics, for instance for remedial education, that get embedded in the “academic” budget of the university, and so escape identification, and other quasi-academic programs that employ coaches and other athletic staff in off-seasons. The probability of any one student participating in intercollegiate athletics actually later playing that sport professionally after the years of their eligibility, particularly in the high-visibility sports of football and basketball, is very small. Here are the numbers of student in some sports in the NCAA schools going pro after university. Also remember that not all colleges and universities with intercollegiate athletics are NCAA members, for instance the NAIA, where the “turn pro” probabilities are even lower. According to the the NCAA itself, the National Football League had just 253 draft slots available in 2017, a tiny fraction of the students playing in any one year. The odds of being drafted, let alone succeeding in that league, especially if you are not from an NCAA Division I school, are very small indeed. Also note that the length of the professional sports career is not shown here. One source suggests that the average NFL career is just over three years in length. Indeed, at this probability of success, promises by college recruiters of some kind of “fast track” to a professional athletics career might be seen as bordering on the fraudulent. By contrast, if you get a degree in actuarial science from a decent institution, your probability of “getting drafted” by an employer at a well-above-average salary are nearly 100% and your career can last 40 years. Not as exciting, surely, and the salaries are not quoted in millions, but the career-ending injury rate is also much lower. What is much harder to get data for is the cost of intercollegiate athletics programs in the schools below the top tier, where there are no television contracts to foot the bills. 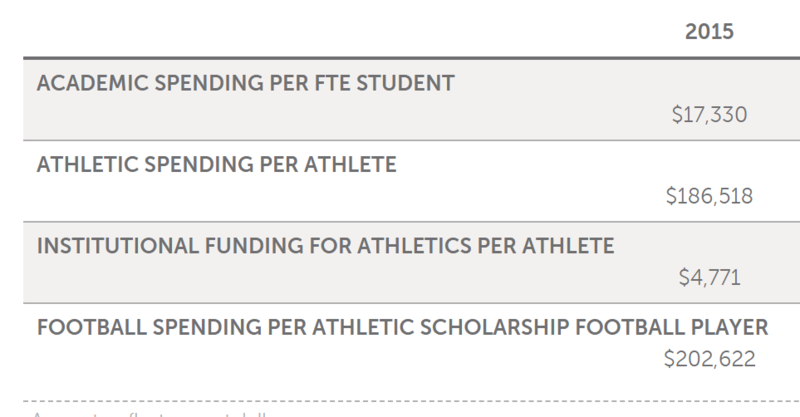 In these schools, the cost of athletics is usually not a separate, externally-funded business, especially outside of the bigger fan draws like football and basketball. In many of these schools, the promise of athletic participation beyond high school is the draw to the school, and the institution responds with various “discounts” as discussed in this earlier post, usually characterized as “financial aid,” promising a college education in return for athletic participation. The students “do the dance” in return for a break on tuition, but most likely this is the last of their competitive playing days. In reality, that recruited student’s most desirable asset sought by the institution is something I have heard coaches call call The Bring. “The Bring” is the amount of outside-the-institution cash from state and federal financial aid, as well as parental contributions, that the student contributes to the coffers of the institution. From that earlier post on the “fixed cost dilemma” in higher education I noted that, for schools running underneath their classroom and housing capacity, the incremental cost of housing and educating one additional student can be very low, and so a large tuition “scholarship” can often be awarded, with “The Bring” insuring that the institution will wind up with more real cash than it expends in a purely accounting sense. The result for many schools has been an increasing reliance on prospective students who will engage in athletic participation just to keep the cash coming in. Coaches will invariably defend this, as they have often done to me when I was a university administrator, as giving young people “the opportunity for an education,” and granted, there is a similar push in many schools to apply “The Bring” philosophy to non-sports participation areas such as music and theater. As I noted before, however, if the goal of progressives is “free college for all,” then we need to seriously consider whether the additional expense of making students “dance” for their education (either in the campus theater or the athletic arena) is a socially-useful, let alone cost-effective, goal. Some students attend college specifically because they want to play their sport, but how many would opt out if it were not required to maintain their financial aid? And if there were to be some “success” in lowering the end costs to the students, what would happen to the athletic programs and their schools that rely on “the Bring” for financial survival? What we often wind up with is the worst of all worlds. Many students who would be much better off, in the long 40-year term of their post-college careers, in a two-year vocational track are routed instead into a much more expensive four-year program, where large numbers of athletes drop out with lots of debt but with no marketable degree. Alternatively, as one coach pointed out to me, perhaps we need some vocational programs with very good football teams. The last post in this series, about viable alternatives to traditional college credentials, has now been published. The baseball numbers look better than those for most other major sports. (Only ice hockey comes close.) There are a few caveats, however. 2. Drafted baseball players never go directly to major league teams. They typically spend several years in the minor leagues, and a rather high percentage of minor league players never have an appearance at the major league level. 3. Major league teams have probably been aware of most college-level players who are potential major league players since they were in high school. Michael Lewis’s “Money Ball” has a discussion of how major league teams often prefer to draft players out of college because they can evaluate their development against their “potential.” Playing college ball is an alternative to going directly from high school to a minor league team. So, about 60% of players taken in the annual baseball draft come from NCAA teams. 4. Life as a minor league baseball player is a precarious one, full of poverty and uncertainty. The odds of making any kind of decent money as a professional baseball player, say enough to support a family, are quite a bit lower than the 9.5% figure would suggest. At least in the NAIA, baseball has the most brutal college season of any sport with, in the school I am most familiar with, over 60 intercollegiate games per season on the schedule, often less than 12 for football.